There are various sand washing and recycling machines in LZZG, such as stone washing machine, spiral sand washing machine, wheel sand washing machine, fine sand washing machine and so on. Our company has introduced advanced technology from developed countries, and established the international advanced production line and first-class modern testing base. Besides, set up a sand washing equipment reserch team. We all know that fine sand recycling machine plays a vital part in the minging field, while it has existed many problems during operation,so many customers are puzzled by those problems. Now, LZZG will introduce some relevant information about fine sand recycling machine so that customers can know well about it. Fine sand recycling machine, also known as fine sand collection machine, fine sand extraction machine, fine sand recovery device. It is a device for dehydration, desorption and desludging of slurry materials, the featuers of this machine is that it can solve the problem of fine sand loss in the process of operation. At present, most of existing artificial sand production lines adopt wet production technology. 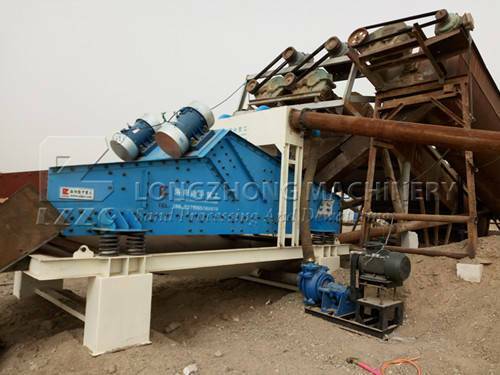 No matter type of sand washing machine is used, the shortcoming of this machine is the serious loss of fine sand(granules above 0.16mm), some lost more than 20%, which not only cause serious losses, but also severely affected the gradation of fine sand, resulting in unreasonable gradation and coarser modulus, which greatly reduced the quality of mechanical sand-making. What’s more, the excess of fine sand discharge will cause environmental pollution. In order to solve the above problems , our company has innovated a series of fine sand recycling systems. This system is an advanced fine material extraction device designed by our company to absorb foreign world-class technology and combine with actual condition of sand powder. In the practical application of the fine sand recycling machine, no additional water consumption is required, and more than 85% of the washed sand or ore can be extracted and recovered from the originally discharged wastewater, and then directly incorporated into the finished product pile or stored separately for use as high-grade timber, which directly to recover the comprehensive economic benefits of more than 15% for customers. Now, this machine has been launched in the market and in great demand, many clients think that it is the best choice to buy this machine for its advantages and econnomic benefits.